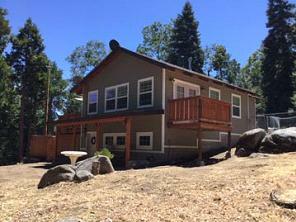 We have wonderful new property owners this year joining us on Palomar! But, more listings needed! Please stay tuned and subscribe to Palomar Mountain News so you can be the first to know! Meanwhile these new owners are having a wonderful time enjoying their first year a mile nearer heaven! Million dollar view! 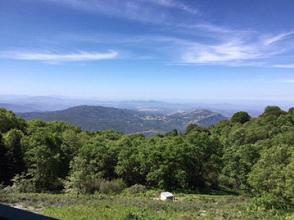 Take-your-breath-away views at the southwest rim of Palomar Mountain. Dramatic views from every room. Amazing drama watching clouds below, storms come in, the sunsets, and that clear, dark sky for telescope viewing. Gorgeous inside!!! Custom craftsmanship throughout 1789 sf, in warm, inviting Craftsman style. Can be used as three bedrooms with enchanting master suite. Finished garage is presently a workshop but with the bathroom, it wants to be a guest cottage for family and friends. Wonderful patio for entertaining. Lots of extra parking for all on level, usable half acre with great year-round access. Weekend or live full time above the clouds, a mile nearer heaven! On a clear day, you can see forever… Look out from the great room, all across the county to Point Loma, Downtown San Diego and Coronado Islands off Mexico. Watch the sparkling city lights come on from your very private setting with two stories plus a large loft, open beam ceilings. Master bedroom and bath on the walk-in level with the loft for guests and a huge game room and workshop down stairs. Built in 1980, 1438 sf. on .68 acre. Paved driveway and parking. Perfect place to try out your four wheel drive! A fixer is waiting, high on huge boulders. The Observatory view peeks through between the firs, cedar and oaks and could be opened up. Built in 1927 with 736 sf. Vintage stone fireplace, 2 wood stoves, kitchen, bedroom and bathroom, propane wall heater. Laundry area. Bring a big tool box and enjoy planning your project on nearly an acre of land. Very private and secluded! Peaceful, southern view from charming A-Frame tucked away on 1.04 acres. Bring your 4WD down one of our tree-lined, "public roads, privately maintained" (new news per the county!). 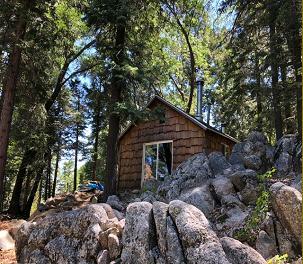 The cabin was built in 1978 with a wood stove in the living room, a bedroom, large sleeping loft and eat-in kitchen in 1294 sf. Pier and pole construction, the seller closed in the basement for a nice workshop and laundry area with a half bath. Well, power, phone. Looking for an 'as is' buyer so it is great to have a place for your tools as there are a few projects waiting for you. APN 135-400-75 with deeded easements! 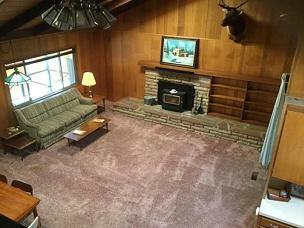 Welcome home to a very nice cabin with huge great room, open beam ceiling and big fireplace. Large kitchen, breakfast counter and great storage. 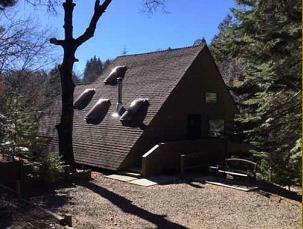 Bear's Den was built in 1964 with wood siding but those pesky woodpeckers moved in. So, the owner's had easy care vinyl siding installed. 1512 sf with two bedrooms on the walk-in level, a stand-up loft upstairs with 'secret passageways' for tons of storage, and bath and a quarter, and big laundry room that just may turn into a charming dining area... Also great basement storage. From a deck to the south, you see sparkling city lights. The north side is calling out for a deck to enjoy the cluster of rocks peppered among towering cedar and fir. Great parking and property was just groomed to CalFire and Forest Service standards. The Bear's Den is ready to move right in! Priced for a quick sale! Sold before process. Comp purposes only. Charming setting for log cabin. 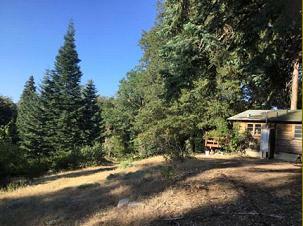 Cabin and outhouse both permitted and built in 1966, off grid with propane and generator only. Beautiful setting with potential of Observatory view once again. Vintage apple orchard with delicious crop needs restoring as it is very over grown. Landlocked. Needs new roof and plumbing, remodeling and updating. 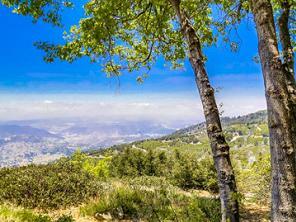 Private setting surrounded by oaks, cedars and firs an abundance of wildlife. Sold! 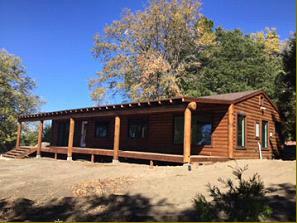 Log-sided New Home, Guest Cabin & View! Finishing touches are being made on a 2017 custom, log sided home, plus a remodel on a vintage guest house. Kitchen appliances are on their way and the 'icing will be on the cake' soon. See Point Loma and the San Diego skyline with the Coronado islands dotting the Pacific from every room and the 60 foot Trex deck. The great room has a wall of glass looking out to the view from the dining area and kitchen. 1281 sf includes 3 bedrooms, two full baths, a laundry room and lots of storage. Cute-as-can-be guest cabin, built in 1928 with a fireplace in the 353 sf. now with a full bath and room for a kitchenette. 10x12 shed for your tools and those sleds! Nearly an acre and one of the most level properties on all of Palomar! Come away to a very charming cabin with a dream kitchen! Top of the line appliances, double refrigerator and freezer, Bosch cook top, double ovens, microwave and dishwasher in open kitchen, chopping block counter top. Large pantry/office. Just like new! Fireplace has an efficient woodstove insert and wired above for flat panel TV. One bedroom, large walk-in closet/laundry room (now, that makes sense!!!). Deck, balcony, covered porch, new Tuff Shed… great access and tons of parking. Fenced back yard for your pup with beautiful boulders and water feature on .6 acre. Some furnishings negotiable so you could move right in!